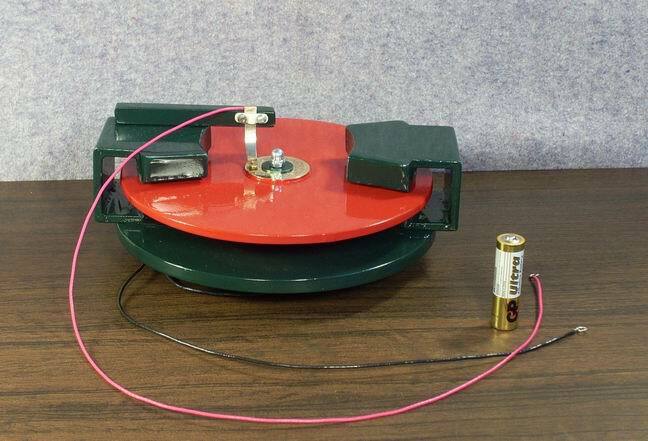 The world's first modular disk electric machine MDEMB-01. The world's first modular disk electric machine Belashova MDEMB-01 in which one or a plurality of multi-turn winding disk dielectric rotor without changing the direction of the current in the conductors pass through one or a plurality of permanent horseshoe magnets. Magnet poles of the system excitation of the stator, which are located in the same row can have a different direction of the magnetic fluxes. Modular-disk rotor of the electric machine Belashova MDEMB-01 has two series of multiturn windings can with the first series of multiturn windings to rotate from a DC source, and with the help of the second row multiturn coils produce emf DC, and the work expended the rotation of the rotor of a dielectric in a magnetic field, will always be greater than elaborated emf DC. Known early model motor (wheel Barlow) invented in 1823 British physicist and mathematician Peter Barlow, but no one in the world to date has not been able to invent an electric car that has one or many of multiturn windings, without changing the direction of the current in conductors, dielectric disk rotor pass through one or set of closed magnetic field systems. Previously there was no electric cars, in which the amplitude and waveform AC or DC multiturn coils do not change their performance during their passage through the magnetic field of the magnetic system so there was no need to enforce laws and mathematical Belashova formula. Now, after the invention MDEMB-01, you will need to do full conversion efficiency all produced electric cars. In the rotor disk module-electric machine MDEMB-01, no steel cores, as in the electric car EMPTB-01. electrical machinery steel rotor magnetic core can not compete with electric machines having a dielectric rotor. Superfast modular disk electric cars MDEMB-01, do not have reactance multiturn rotor windings at any frequency. - With 1.5 the number of revolutions of the electric machine reaches 108 r/min. - At 12.8 in the number of revolutions of the electric machine reaches 1400 r/min. The model is as open and clearly shows that the current movement a multi-turn winding in one direction. Modular-disk electric machine Belashova MDEMB-01 will work AC of any frequency, if the system is made of excitation of electromagnets. For the manufacture of high-grade, or reference, the electric machine MDEMB-01, to conduct research and development.